With space at a premium and a lot of people simply not having time to use a bath, free standing showers are becoming increasingly popular. Being able to simply step into the shower is also much easier than climbing into a bath, especially for those with mobility problems. However, not every bathroom has the benefit of a ‘wet room’ style floor, with drainage and sealing. Instead, shower units need to be assembled as a whole kit, including panels, pipe, head and don’t forget the shower tray. 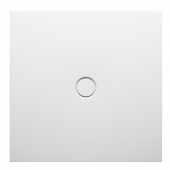 Many people who install a new shower forget that the unit needs a base, something to be mounted on that also provides a place for the drain to be fitted. So when you shop around for a new walk in shower, don’t forget to spare some money for the perfect shower tray. There are some surprisingly affordable options online, including trays from designer brands. When searching for your tray, you can save a lot of time and hassle by settling on a shape first. Getting the shape wrong will prevent the unit from fitting together properly. These are the most common shapes used by tray manufacturers. Pentagonal shower tray. These five-sided trays are great for a corner unit that needs to save space, leaving one side for a central door panel. Half-circle shower tray. These D-shaped trays are ideal for a circular shower type that needs to go flush against a wall. Rectangular shower tray. With a simple rectangular or square shape, these are roomy and straightforward to install. Round shower tray. A round tray is the only choice for a free standing circular shower. 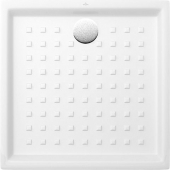 Quarter-circle shower tray. A quarter-circle or quadrant tray is similar to the pentagonal style, but with a stylish curved edge. Make sure to pick the right base, as it will decide the parts you need for the entire unit. Always take time to measure up the tray against the area you want it to fit, as returning incorrect parts can be costly. Once you pick a shape, you can look at some of the great designs available. A common mistake by people installing new bathroom units is to focus on the main visual aspects and neglect the structure. However, this can lead to mismatching. For example, chrome shower pipes look great and seamless panels are very sleek, but they could clash with a basic shower tray that doesn’t quite match, or feels cheap when stood on. Take a little time to browse the internet and you’ll soon find some discount items that still come from dependable brands. You can even buy for less than you would in a high street store. Three of the major brands that produce great shower components are Bette, Kaldewei and Villeroy & Boch. Bette have some minimalist quadrant trays in the BetteFloor Corner range, which have an anthracite white finish. 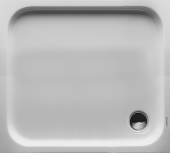 Bette also produce the BetteDarling series with detailed square trays, that feature antislip coatings and chrome drain caps. 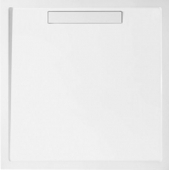 These high quality trays are the perfect complement to a high end shower build. Kaldewei have a very affordable and durable Sanidusch range in alpine white, great for frequent use. 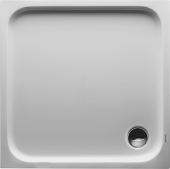 For something more elite, Kaldewei Avantgarde Superplan trays are elegant and have sizes for even the largest showers. Many designers turn to Villeroy & Boch for minimalist options. The Subway range has square, rectangular and curved corner trays with an anti-slip, sanitary Ceramicplus finish. 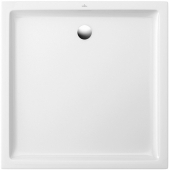 Try OMNIApro, also by Villeroy & Boch for a mixture of depth options. 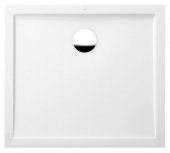 You may also consider the brand Duravit for some very simple but stylish rectangular trays in the DuraPlan range, that are flush fitting for a seamless appearance and are made of sanitary acrylic. 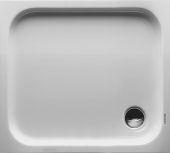 Duravit also produce various tray accessories, like drain traps. 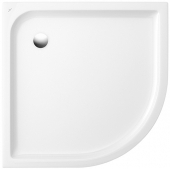 The brand Keramag is a smart choice for pentagonal bases, such as the Renova in alpine white. Finally, consider Artweger’s Twinline series if you prefer to dispose with the tray and have a walk in shower combined with a bath. Whatever shower tray set up you choose, taking a little time to research the benefits and price tags can help you perfect your bathroom design.